Hi everyone! As most of you know, we recently moved. 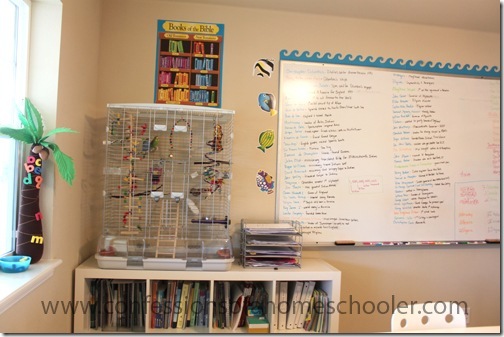 And I’ve had a ton of requests to see our new homeschool room setup! Obviously we brought all of our furniture with us, so it’s fairly similar to before. But the new room is a tad smaller, so I did make a few adjustments to the layout. So without further ado…here’s our Updated Homeschool Room Tour! Here is the entry to our room. I have my little reading bench, calendar area, and a few posters on that wall. As you can see most of my room is setup as it was before, so there aren’t any really drastic changes. I did clean out a bunch of the clutter, so believe it or not, there is actually less stuff on my shelves than before! Of course I kept the white board, and my favorite Ikea Expedit Shelving unit. There has been a change since I filmed the video! Actually it was only a few days after of course! But most of you know, we added two little budgies to our room! I’ll have a post introducing you to Remi and Kiwi coming soon! Once we moved the birds into the room, we needed to rearrange some of the furniture so they had a safe place to set. Below you can see our school desk setup. I have a whole post on our Ikea desk units you can check out. They discontinued the table tops I purchased, but they replaced them with the Linnmon Table Tops, white. I moved my desk and reading incentives over to this corner. I actually like it better this way too, so I’m glad we made the switch. And that’s it! I hope you enjoyed our new schoolroom setup. So far, so good for us! I normally don’t post on blogs, but your new schoolroom looks great! Can I ask the dimensions of your new room? Thank you so much! I think it’s about 14′ x 14′. That was with me “walking it off” so it’s not exact. But it is a square. What a fantastic school room! It makes me want my school room back (all neat and tidy and organized just like my perfectionist self likes!) but we found that doing school out where we do life worked better for us, so the dining room has become our little area for school. 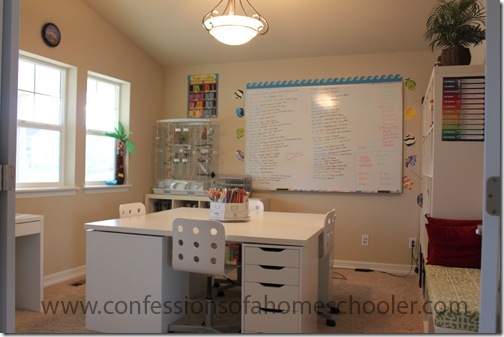 But I still love looking at pictures of well-organized homeschool rooms. Yours looks like it came together beautifully. And thanks for all your great homeschool posts! Love this!! Your old schoolroom gave me MUCH inspiration for this year and I sooo appreciate it!! Thank you for taking the time to share with us! PS- Any chance we could see your new kitchen? From your cooking posts, it looks beautiful!!!! Oooh, I am so envious! 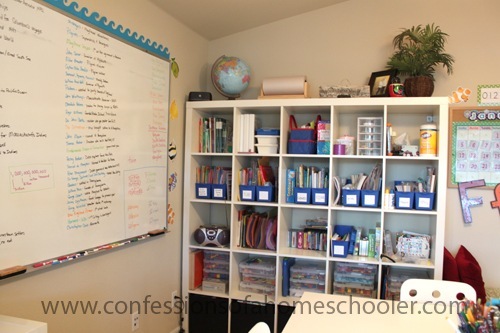 I want to have a dedicated school room, but sadly our house just doesn’t have a room to spare! I love how light and airy it is, with lots of room for learning and inspiration. I hope to one day be able to do the same… We have a large bookcase dedicated to our school, and we school at the dining room table… It works fine, but I’d still love our own class space!!! Thanks for sharing it with us…. It’s wonderful! my husband just made a super valid point… why do parents NEED a master bedroom!? 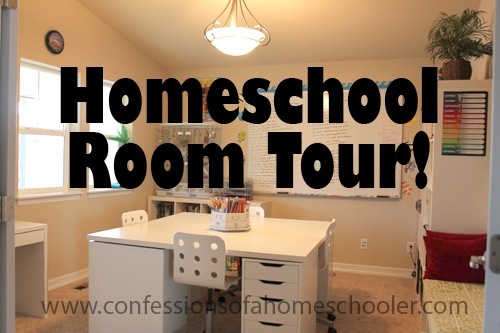 We’re going to put our bed in a regular room, double the kids up in boys and girls rooms, and use the master bedroom as a homeschool room! 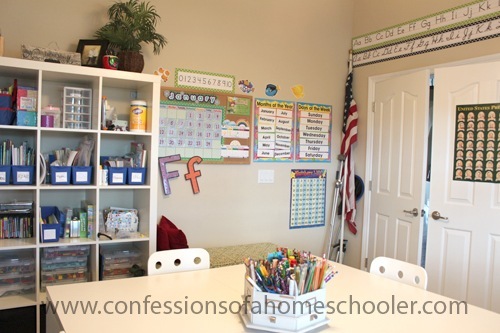 Your first homeschool room post was an inspiration for our school room. Thanks for sharing so many great ideas. Thank you so much for sharing! Do you happen to have a link to purchase the 8×8 storage containers from The Container Store? I am having trouble finding them on the website. I think the room is about 14′ x 14′. That was with me “walking it off” so it’s not exact. But it is a square. Our desks are 5′ x 5′ square. 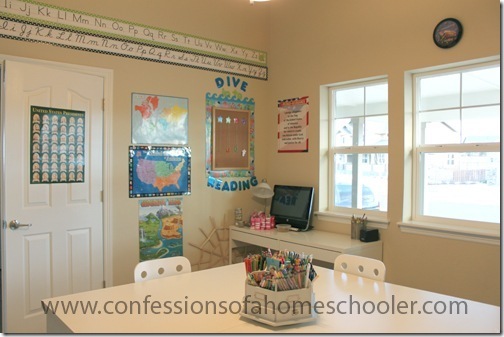 I can’t wait to have a schoolroom. Right now it will probably have to wait for 2-3 years. Our last child was born two wreks ago and so that puts us with three kids too young for school and two in elementary. Our little ones would destroy any attempt at an organized schoolroom. But once our baby boy gets old enough to sit at a table or in a room and play without the normal dump everything stage then we will have a school room lol. Currently its the dining room table which is betwren our living room and play room. Makes it so much easier for everyone. 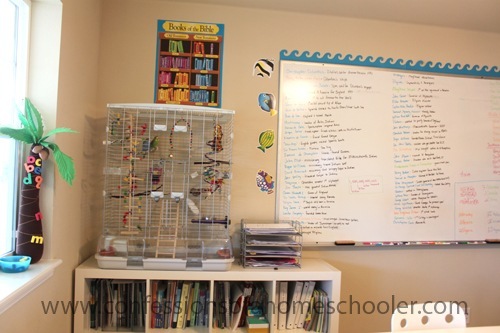 My organizational self, however, wants a school room organized and pretty 🙂 I am curious, don’t the birds distract the kids?